As an email marketer, you need to create an email list—and grow it. Does that mean your list needs to be large? No. But it should contain the addresses of people whose challenges are largely relevant to the solutions you provide. You see, above all, the email list you build has to be useful. Useful works both ways. You use email marketing to nurture leads and increase sales. Your readers use the content you deliver to learn, grow, and improve their lives in one way or another. 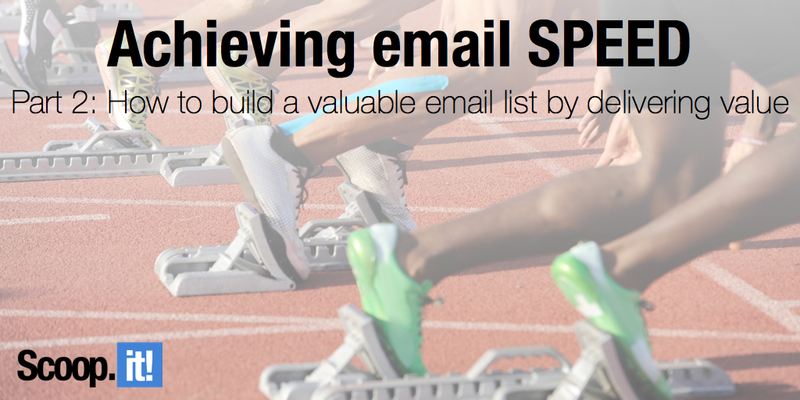 So how do you build a valuable email list? Need ideas? Here are 26. Let’s examine some of the effective ways you can go about collecting email addresses. The most effective way to capture email leads is through a landing page, which offers your free resource. For optimum conversion, your landing pages should have a singular focus and shouldn’t include any navigational elements that act as escape routes. Don’t make the form you place there tricky or time-consuming. Request only what you must know. A name and email address should suffice. Pop-ups have become popular and far more accepted than their early days. They’re offered by a slew of services, paid and free, in a variety of forms (light box, slide-ins, scroll-induced, exit-induced, etc.) with various features. And they work. An alternative to the pop-up, which you might find less intrusive is the feature box. It’s basically a row on your website—generally on the home page—which functions like a pop-up, but is a permanent fixture. Another approach gaining momentum is the page-dominating preview page. That is, when a new visitor arrives, the first thing loaded is a landing page of sorts that dominates the page and offers a subscription. SumoMe offers a variety of lead collection tools including “Welcome Mat,” which makes it free and easy to execute this tactic. I’ve experimented with SumoMe’s Welcome Mat tool on my website and elevated opt-in conversion rates with bold messages such as this. The idea is to create a valuable collection of content on a specific topic, promote it centrally via a single page, and make it available exclusively to those who opt-into a free membership. Bonus 1: The approach helps you capitalize on older, possibly less visible content. Bonus 2: These pages make for an effective SEO strategy. You can link to them from guest posts and other features. Because they serve as a content hub on a specific topic, they often rank well in search engines. 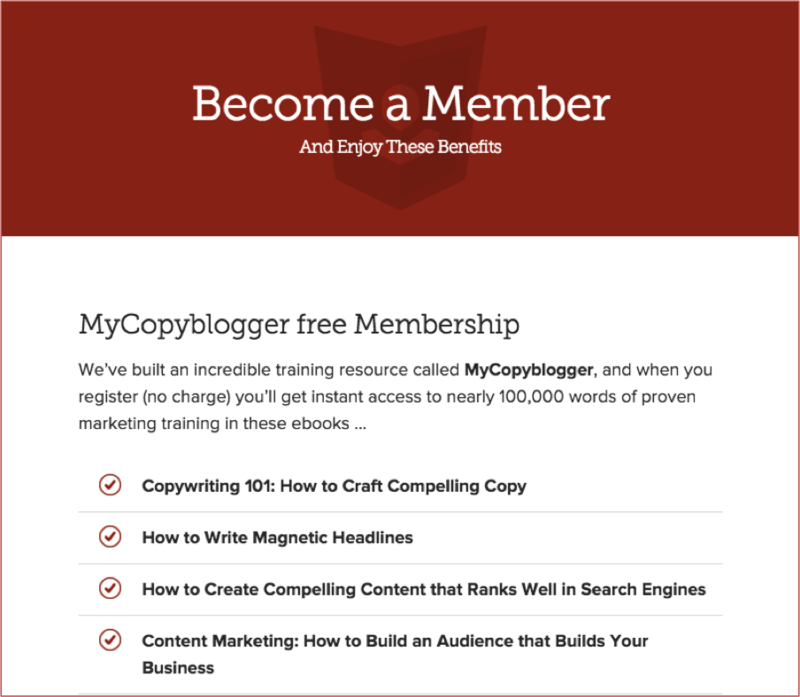 Here’s a great example of the membership or hub strategy from Copyblogger. Placing a form in the sidebar of your home page, blog or anywhere across your website is a popular convention and is made easy by your email service provider. You can mention a specific incentive there as you would on a landing page or keep it bare bones. You may want to create CTA boxes to be placed strategically on select pages that do not include a form. 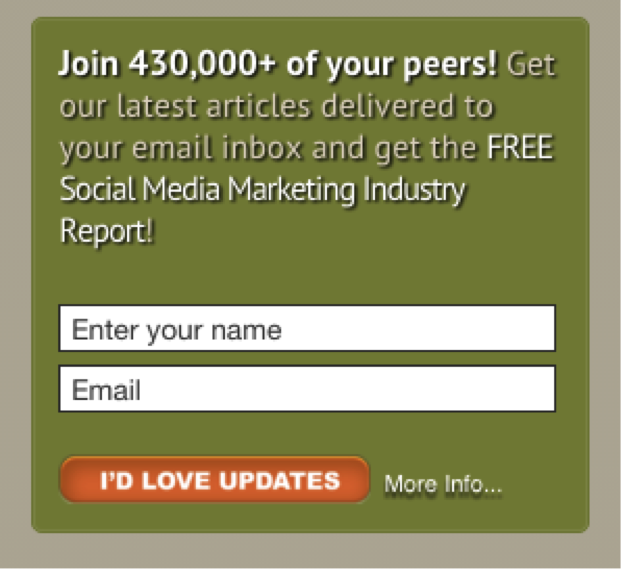 Rather, a click would direct the reader to a page where they can opt-in. I’ve covered the more popular strategies, but the list goes on. Remember, your email list is a valuable asset. Treat is as such by further developing ways to expand it with a steady stream of quality prospects. So you’ve created some combination of lead magnet and opt-in forms or pages. Don’t allow your hard work to go to waste. Seize every opportunity to maximize conversion rates. SocialTriggers.com uses a forceful feature box that persuades viewers to comply. Numbers—People like to join the crowd. When your email list begins to gain some traction and grow, you might use the “consensus” principle of persuasion by revealing the number of subscribers you have or speaking to its fast growth. You may not be able to boast a number the size as Social Media Examiner (few could), but you get the idea: join the crowd. Note the additional incentive and fun CTA. Testimonials—Your opt-in offer can include a plug from one or more satisfied subscribers who reveal why they benefit from receiving your updates. Whatever you do, sell your email. It’s going to deliver value, right? Different customers on your list are likely to have various interests in the content and products you offer. For instance, your content may be gender-specific, or suited specifically for beginners or experts. Location can be a factor as can any other variable. The segmentation capabilities most email service providers offer can up your game by enabling you to use data you have about subscribers to create and send targeted campaigns. As you probably suspect, more personalization equates to higher relevance and ultimately better conversion. Essentially, you’re able to tell a better story. Start slowly—In most places, say with pop-ups or sidebar forms, keep things simple and just ask for an email, but with specific landing pages you can begin to gather additional information. Offer autoresponders—You can build more targeted lists by making specific offers that are fulfilled automatically with an email or series of emails. Subscription options—Give customers the option to get notifications based on their desires. 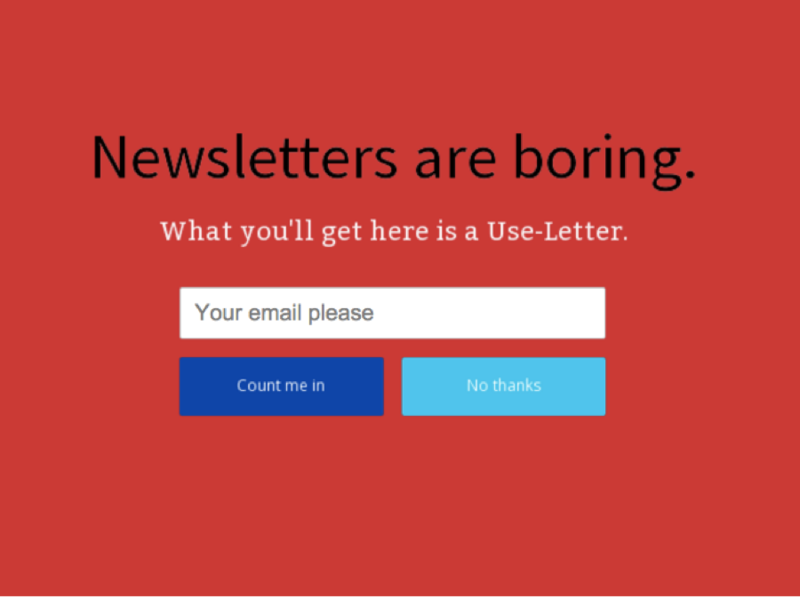 Examples: frequency, subject matter, type of email (newsletter vs. discounts, etc.). Advanced segmentation— Advanced segments can be created based on purchase history, email consumption, website activity, demographics, and more. You can use any combinations of data to define a specific group of customers. Email marketing is a deep subject. We’ll cover a lot of helpful information in our multi-part series. Click here if you missed the first post featuring the benefits of email marketing, how to choose an ESP, and how to get started with email templates. And stay tuned for the next post featuring deep dives into the various types of email effective content marketers utilize. 1 Comment on "How to build a valuable email list by delivering value [SPEED email, Part 2]"
Nice But for increase Email Must use some Tools to save time I have used few tools for my business for growth hacking like AeroLeads, rainClutch , Rapportive and this tools help me a lot.